Premature death is strongly associated with poverty, which exposes people to health issues and higher rates of violence. The impacts of premature death are grief for friends as family as well as economic losses for the community due to lost years of working life. 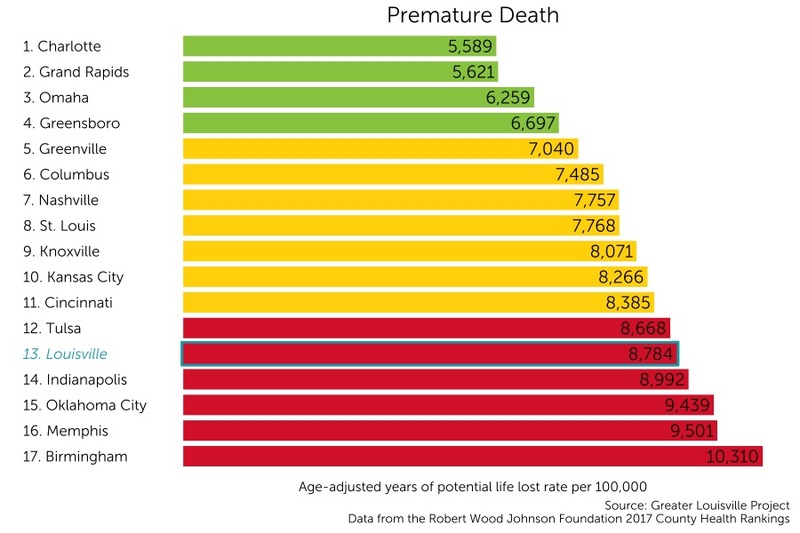 Louisville currently ranks 13th among its peer cities in age-adjusted years of potential life lost per 100,000 years with 8,668 years of life lost per 100,00 years. Louisville ranks among the bottom tier of its peer group according to a natural breaks algorithm. Cities in green are those that outperform their peers, cities in yellow represent the middle cluster, and those in red are a group that lags behind its peers on this indicator.